Bottom right: Darren with the lovely Amanda Brunker! Speaking of getting physical (I know, a seamless segue! ), I try to do the odd bit of running to offset my massive sweet tooth and coming into winter I do like to have something a little heavier than a standard wind breaker. This Nike jacket (€75) is the perfect in-between, and the reflective yellow panels are a great way of introducing a safety element. But practicality aside, it just looks good. Whether he wears it running or teams with some jeans and runners, he’ll be good to go. There’s a nice selection of jumpers coming too and I do love a comfy jumper. 9 times out of 10 you’ll find me in one and if you think I’m lying just take a look at me here .The material on this Notre Dame jumper (€40) is extremely soft, definitely something for winter. I think most guys would like to open something like this on Christmas day. Now onto the women on your list. I’m no Gok Wan, but of the tops on offer the ones that caught my eye were this cheetah jumper (€55) and this bright orange tracksuit top (€68). Nothing says 80s like animal print and bright colours! There’s a huge variety of runners coming up from Life Style Sports but it’s the high-tops that do it for me and this grey pair really stood out. Ladies, if you haven’t tried a high-top let me change your world! Stylish and super comfortable, what’s not to like? These bright pink ones (€90) from Nike can only serve as an excellent addition to your wardrobe. Hope this gives you some gifting inspiration and what do you think, would you give high-tops a go? 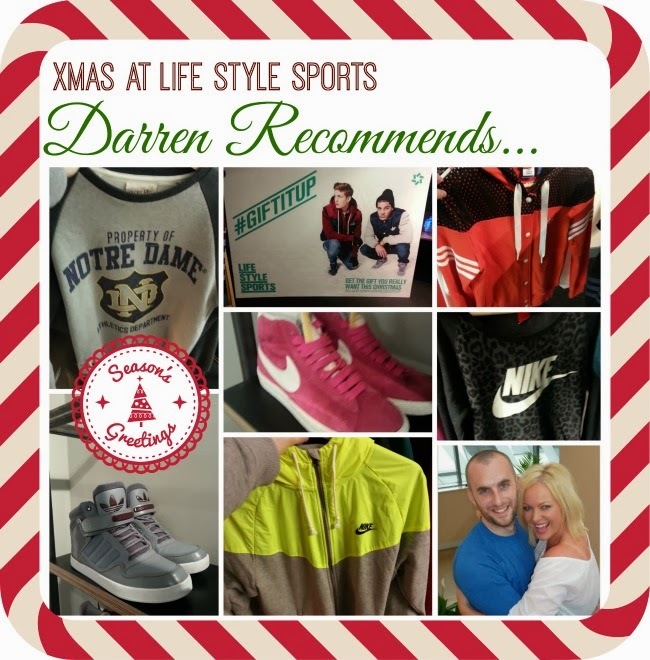 Follow Darren on Twitter @darcom51 and check out my stocking stuffer ideas, Christmas Gift Guide for Her and Mr Fluff's picks for the men on your list! I like how hi-tops look on other people but I am never sure how to wear them myself! Skinny jeans don't really suit me. Oh I don't know if I could work a high top to be honest but I'm very tempted because they look really comfortable! Beautiful pictures!! I love them!! Love the grey Adidas and I'd definitely get one of those running jackets if my knee wasn't banjaxed! Those pink Nike's are FAB! I believe that great exercise clothes really contribute to my motivation to work out! Very cute picks! I'm also a big fan of high top sneakers! I really like those pink Nikes!I really love the red Adidas jacket you picked out as well! My kids are all active in winter sports. They could really use some new equipment so I will be giving them a lot of new outdoor sports gear for Christmas this year.